The Information Technology (IT) Department at Asher College recently announced that they will be reintroducing a popular service at their Sacramento campus: the PC Repair Clinic. The PC Repair Clinic at Asher College is a free service that is open to the public in and around Sacramento, California. Through the PC Repair Clinic, members of the local community may make an appointment to drop off their broken or malfunctioning computers at Asher College. The PC clinic offers free repair, virus removal, installations, and maintenance. Under the supervision of Asher instructors, the work is performed by Asher students who are currently enrolled in Asher’s Information Technology programs. Asher’s PC Repair Clinic is valuable for students and the public alike. The clinic allows Asher’s IT students to get real-world, hands-on experience in their field. At the same time, it is also an excellent resource for people in the Sacramento area who need help getting their computers fixed. 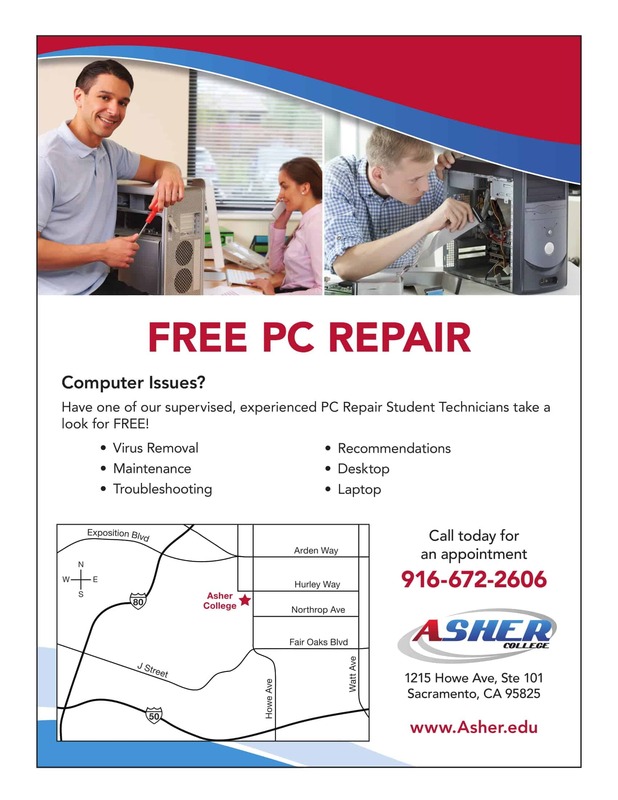 To schedule an appointment with the PC Repair Clinic at Asher College in Sacramento, call (916) 672-2606. Computers are accepted for drop off each Thursday from 2-5pm and repairs will take place Thursday and Friday. The Asher campus is located at 1215 Howe Ave. Suite 101, in Sacramento, California. Asher College is an ACCET-accredited vocational career college with locations in Dallas, Texas; Sacramento, California; and Las Vegas, Nevada. All three Asher campuses offer programs in a number of areas including Information Technology career training, medical career training, computer career training and business career training. Financial Aid, Title IV funding, and Veteran Training Benefits are available to those who qualify. To learn more, visit Asher’s website at www.asher.edu. “For the past 6 years Asher College has had the privilege of serving the greater Sacramento community through our PC Clinic."